The Flu Vaccination: “Nice to Have” or “Must Have” for Older Adults? By Rebecca Rushing (“Nurse Beckie”), BSN, R.N. Some people go to great lengths to keep themselves and their loved ones healthy this time of the year. Even so, there’s one thing we can count on each time the calendar turns to fall: Flu season. If you’re caring for an aging loved one, you’ve probably wondered if a flu vaccine should be part of your seasonal wellness routine. After all, many people view the flu shot as a “nice to have” – something that’s beneficial if it fits into the schedule, but not a requirement for good health. But the reality is that the flu vaccine offers critical protection for older adults, whose immune systems may already be compromised by advanced age or chronic illness. The Centers for Disease Control and Prevention (CDC) recommends the flu shot as something people ages 65 and older simply must have. Following are answers to the most common questions about the flu and flu vaccination for older adults, drawn from the most current information available from the CDC. When exactly is flu season? The flu season is the time of the year when the seasonal flu is most prevalent – from October to March. It typically peaks around December, and it can persist into May. Why is the flu vaccine so important for older adults? People ages 65 and older have a higher risk of serious complications from the flu. Why? Because the immune system naturally becomes weaker with age. And older adults often have the chronic conditions – like lung disease, heart disease or asthma – that can be aggravated by a bout with the flu. The CDC estimates that up to 70 percent of flu-related hospitalizations are among people ages 65 and older. And this age group makes up 85 percent of flu-related deaths. Flu vaccinations can minimize these risks. In fact, the flu vaccine is so important for older adults that a higher-dose version is available to them. This version is shown to provide better immune response and, as a result, better protection against the illness. Does the flu vaccine really work? The flu vaccine plays a significant role in preventing the flu. It has shown to be between 70 and 90 percent effective. That’s a lot of sickness prevention. But it’s not an absolute guarantee you won’t get sick. The vaccine doesn’t protect against every strain of the flu. It does, however, offer protection against the most common types of the illness. Is a shot the only way to get the flu vaccine? In recent years, both injectable vaccinations (or shots) and an inhaled mist have been available. This year, the CDC is recommending only the injectable versions. Due to concerns about its effectiveness, the nasal spray – or mist – is not recommended. At least for this year, a shot is the only effective option. 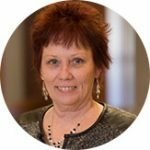 If my loved one got a flu shot last year, do we need another one this year? The immune protection your body develops from the flu vaccine declines over time. In addition, the vaccine is updated each year to protect against new strains of the flu. The CDC recommends getting vaccinated against the flu annually for “optimal” protection. How do I know if my loved one has already had the flu? Many people mistake stomach or intestinal conditions with the seasonal flu. But the flu is actually a respiratory disease. While it can be accompanied by symptoms like diarrhea and vomiting, the more prominent symptoms of the flu typically include fever, cough, sore throat, runny or stuffy nose, body aches, headaches, chill and/or fatigue. Your doctor can diagnose the flu by evaluating symptoms, or through a lab test. If my loved one has already had the flu, can we still get vaccinated? There are numerous strains of the flu virus. Vaccination can provide protection, even for those who may have already had the flu. Is there a deadline for vaccinating? The CDC recommends getting vaccinated by the end of October. But if you miss that window, you can still benefit from the vaccination. As long as a supply is still available, flu shots can be given through January or later. The key is to get vaccinated before exposure to the flu. And the further into the season it gets, the more opportunities there are for exposure. It takes about two weeks after vaccination for the body to have immunity to the flu. Are there any other vaccinations that are recommended for older adults? Pneumococcal Vaccine: The CDC recommends the pneumococcal vaccine to protect against pneumonia, as well as other conditions such as meningitis and bloodstream infections. Shingles Vaccine: Caused by the same virus responsible for chickenpox, shingles can be extremely painful and lead to other health complications in older adults. The CDC recommends a shingles vaccination – also referred to as the Zoster vaccine – for adults 65 and older. 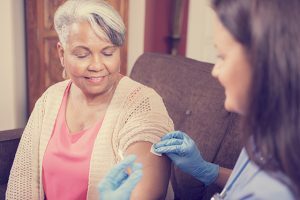 Tdap Vaccine: A combination to protect against diphtheria, tetanus and pertussis – otherwise known as whooping cough – Tdap is recommended by the CDC for older adults who have not received the shot since childhood. Are there other ways to prevent the flu? Steer clear of others who are sick. And if you’re sick, stay home. Use a tissue to cover your mouth and nose when coughing or sneezing. Avoid touching your eyes, nose and mouth, which are prime entry points for germs. Take care of yourself – get plenty of sleep and fluids. Where can we get vaccinated? The CDC has a convenient Vaccine Finder on its website at http://www.cdc.gov/flu/. FirstLight’s Companion Care Services are designed to provide assistance and transportation for important errands like visiting a doctor for immunizations. Find a location today to learn more.